This is the first release in a projected complete edition of Richard Strauss's orchestral music. On a bargain label this is very welcome news especially since David Zinman is a good Straussian and he is teamed with a fine orchestra spaciously recorded. This particular disc is also valuable in that it offers two of Strauss's lesser played works which you might not have already, or might have to buy duplications of better known works in order to get elsewhere. Macbeth receives an excellent, exciting performance. The recording especially catching the brooding bass grumbling that marks out this dark-hued work. The atmosphere of the royal court might be more Potsdam than Glamis through Strauss's ears but it's none the worse for that. It is surprising this piece isn't played more often so a fine recording like this might go some way to promoting it into the concert halls. You really are held from start to finish with the unfolding drama by this fine account. 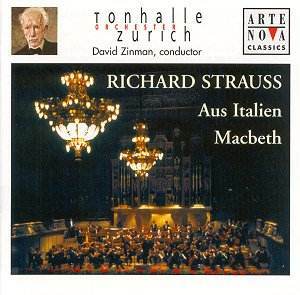 Atmosphere and mood were the aims of the young Strauss when he wrote Aus Italien following the "grand tour" of Italy in his early twenties but Zinman's performance doesn't really recognise this. He seems anxious to stress the symphonic nature of the work much more than, say, Kempe was in his classic Dresden recording. Maybe this is Zinman's way of covering up the work's shortcomings. This is very much an early piece that I think quickly runs out of ideas. The last movement's use of Denza's then newly-written "Funiculi Funicula", for example, has always seemed to me evidence of Strauss's threadbare imagination at that time and not even the tight hand of a conductor like Zinman can ultimately save it. However, if you need this work in your collection here again is a well-played and recorded version that will give much pleasure, not least in the opening of the first movement which conveys just enough the intense feelings of a young man seeing Rome for the first time. The strings of the Zurich Tonhalle have a fine sweep throughout the work and the brass is also caught beautifully in the spacious acoustic. A good bargain release of two lesser-known Strauss works.